Weekdays just got better with City Bar’s latest Power Lunch. Easy on the tummy and the pocket! We say weekdays, but we’re including Saturday for the poor folk who work on that day too. Luckily, City Bar understands that as their Power Lunch runs Monday to Saturday to add that much needed incentive to make it to lunch time without falling asleep! A two-course meal, you can pick soup, salad or appetisers as your first course, and pizza, sandwich or mains for the second. Spanning Asian, Italian and Indian dishes, you’re in for a real treat. Soups are light with the choices being carrot with mint, minestrone or a broth, while the salads include Caesar’s, a fruit and veggie mix (avocado, orange, tomato, cucumber and watermelon) and Spiced Bean Sprouts. Or add Nam Jim (a sweet, spicy Thai dipping sauce) to rice sticks, prawn or chicken. 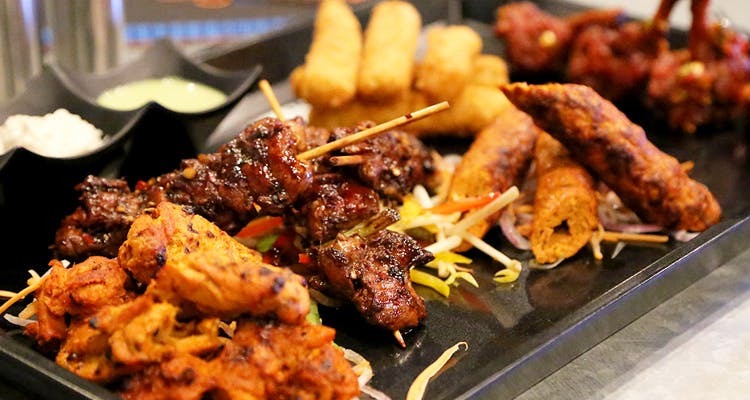 Appetisers range from kebabs, prawn or vegetable tempura to Coorgi pork, potato wedges and hummus with pita bread. So we’re thinking the salad or soup as if you load up on the starters, chances are you won’t make it through your mid-afternoon meeting without napping! We like that the mains are single meals meaning you can’t overeat. So you’re satisfied but not stuffed with a curry (Chicken or Paneer Tikka Malasa, Kadhai Vegetables or the Thai kinds) and a bowl of rice. Or a Butter Naan or roti if it’s Indian. Skip desi khana altogether in favour of pasta of your choice. We however took the opportunity to have corn and spinach lasagna, Burrata Pesto Chicken burger (a personal favourite) and Mushroom Risotto which surprisingly didn’t sit heavy afterwards. You can even throw in dessert, draught beer, wine or sodas, if it’s an office party or you want to impress a client, for an extra INR 75.